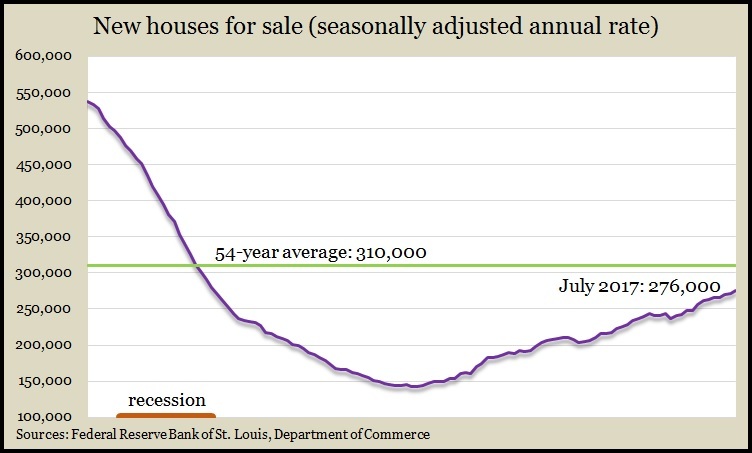 The annual rate of new home sales declined 9.4% in July, according to a report from the Commerce Department. Data showed an annual sales rate of 571,000 residences, down 8.9% from the year before, still below the level entering the recession. The low supply of new houses for sale – which some economists have blamed for holding back the real estate market – remained below the 54-year average. The median price for new houses rose 6.3% from July 2016. 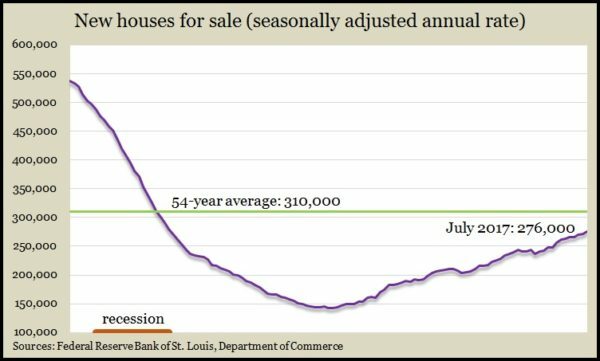 Again pointing to an ongoing lack of inventory, the National Association of Realtors said existing home sales declined 1.3% in July from a June pace that was slower than initially estimated. The trade group said insufficient supply is discouraging would-be buyers and pushing up costs. The median price rose on a year-to-year basis for the 65th month in a row. Inventory was down from July 2016 for the 26th straight decline. The moving four-week average for initial unemployment claims fell for the fourth week in a row and the fifth time in six weeks, hovering near 44-year lows. According to Labor Department data, the level of jobless applications remained well under the 50-year average, suggesting persistent reluctance by employers to let workers go, which could encourage greater consumer spending. A measure of manufacturing prospects, durable goods orders, declined even more than expected in July, falling 6.8% because of a turnaround in commercial aircraft orders. However, excluding orders for transportation equipment – a heavy, but volatile factor – bids for manufacturing rose for the fifth time in six months and were 5.3% ahead of their year-ago pace, according to the Commerce Department. An indicator of business investments, which has been lagging overall economic growth, was up 3.3% from July 2016.